Increase efficiency and revenue by closely monitoring your HVAC vehicles. FieldLogix’s HVAC vehicle tracking system has helped improve productivity for hundreds of HVAC fleets throughout North America. 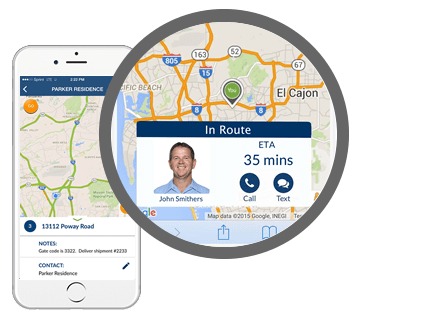 Our users find that FieldLogix helps them streamline dispatching, increase billed hours, and improve client satisfaction. Nationwide companies such as Trane and Fidelity Engineering save thousands of dollars with our award-winning GPS fleet tracking system. Stay on top of the locations and statuses of all of your field technicians with real-time tracking. View each tech’s distance from your jobs in order to make quicker dispatch decisions. Use our optional dispatching features to dispatch jobs to your techs. View your technicians’ status in real-time as they complete their jobs and update their routes as your jobs change throughout the day. We have multiple tools that allow you to better supervise your drivers’ activities and improve driver safety. You can use FieldLogix to monitor where your employees are, where they have been, what they did, and when they did it. According to a study conducted by Aberdeen, utilizing GPS technology leads to a 23% increase in completed jobs. Our system gives you the ability to send your waiting clients ETA’s and collect feedback on their level of satisfaction with your service. Best of all, FieldLogix is typically 30% to 40% lower in cost than most fleet tracking systems!